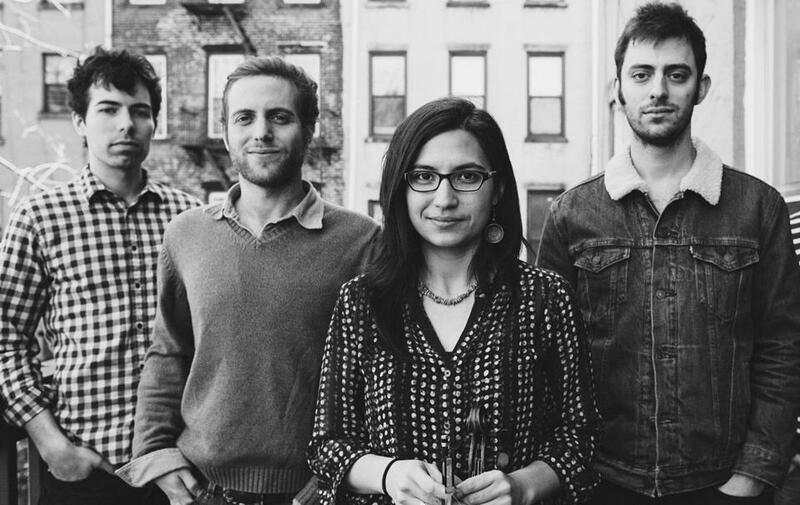 Cricket Tell the Weather members (from left) Sam Weber, bass; Doug Goldstein, banjo; Andrea Asprelli, fiddle; and Jeff Picker, guitar. Andrea Asprelli had to go to England to find America — or at least, the American music that the songwriter and fiddle player has since made her stock in trade. Growing up in Denver, Asprelli had what she calls a vigorous education in European classical music, and didn’t pay much heed to the healthy roots-music scene around her. After heading east to study philosophy at Mount Holyoke College, she spent a year abroad at the University of Kent at Canterbury. There, she met some fellow musicians whose infatuation with American folk styles proved catching. She knows what she’s doing now. Asprelli has brought her classically honed chops and a touch for timeless-sounding songwriting to Cricket Tell the Weather, an acoustic quartet that draws inspiration from a handful of sepia-toned styles, but plays original songs aiming to showcase a contemporary voice. The band pays its second visit to Club Passim on Thursday, followed by two appearances at the Apple Jam festival in Russell on Aug. 21 and 23. As happens in the fluid world of bands working in bluegrass and related styles, the Cricket lineup has shifted around a bit. The group came together after Asprelli met guitarist Jason Borisoff, who was playing with a group in Syracuse, N.Y. The two got some early recognition when their co-written “Remington” won the songwriting award at the bluegrass festival in Podunk, Conn., in 2011. She met banjo player Doug Goldstein the next year during an impromptu hallway jam at the indoor Joe Val bluegrass festival in Framingham, Goldstein says. Jeff Picker, who played bass with the group for much of last year, rejoined in spring on guitar when Borisoff departed. Sam Weber plays bass now. Though the players’ instrumental chops are in evidence, Cricket’s self-titled debut LP, released last year, is very much a song-based affair. “Remington,” informed by Asprelli’s many tours of abandoned buildings in and around Bridgeport, Conn., when she worked for an affordable-housing nonprofit there after college, is about the Remington ammunition plant, which closed in 1986. New song “If I Had My Way” re-appropriates the chorus of the traditional song first recorded by Blind Willie Johnson, and later reworked by the Grateful Dead (as “Samson and Delilah”), among many others. The child of an Italian-American and an Indonesian immigrant, Asprelli makes no claims to austere authenticity beyond the honesty of her own creative voice. But her contemporary spin on inherited forms is very much part of the American musical tradition. Now based in Brooklyn, N.Y., Cricket has yet to tour very far from the Northeast. Still, the band has been gaining momentum. It won the inaugural festival-award at FreshGrass in North Adams in 2013, and participated in the emerging-artist showcase at Falcon Ridge Folk Festival. In the wake of Borisoff’s departure, a new album in the fall will display the band’s focus on Asprelli’s songs.